Push notifications are used in mobile apps for consumer and business scenarios primarily to engage app users and help them prioritize key tasks. 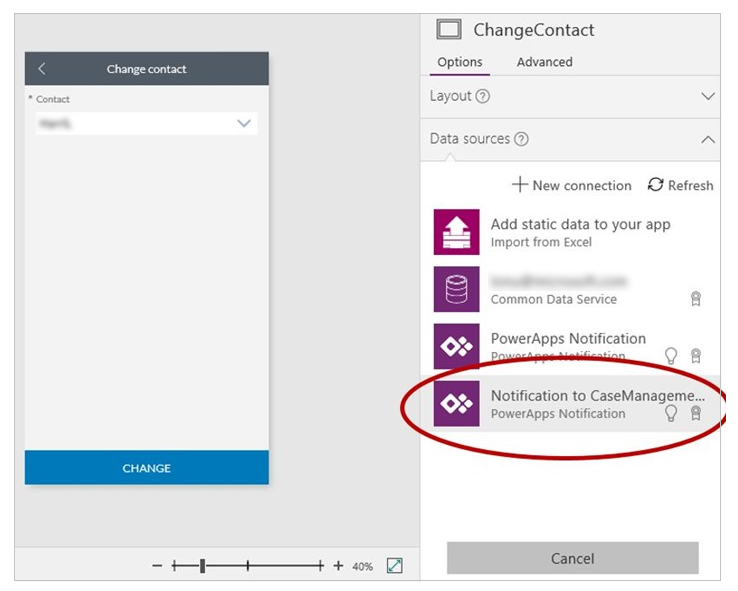 In PowerApps, you can send notifications by using the PowerApps Notification connector. You can send native push notifications to any app that you create in PowerApps. We plan to add more notification types in the future. Your users need to know information immediately. Your users must complete important tasks by using your app, in a preloaded context. You want to engage your users on a specific interval, or you need users to enter the app in a specific context. 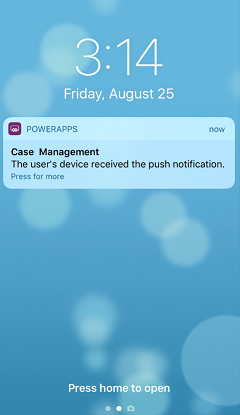 To receive push notifications, each user must have opened the app in PowerApps Mobile once or gotten the app from AppSource in Dynamics 365. In an app for which you have the Contributor permission, add a PowerApps Notification connection. If you don't already have an app, you can quickly create one from a template, and you'll have the required permission by default. That tutorial and this one use an app based on the Case Management template. If you trigger a push notification from a flow, you can send the notification to only one user or security group at a time currently. In Microsoft Flow, create a trigger that specifies when the push notification is sent. For example, you might want to send a notification when a record is added to the Case entity in the Common Data Service. 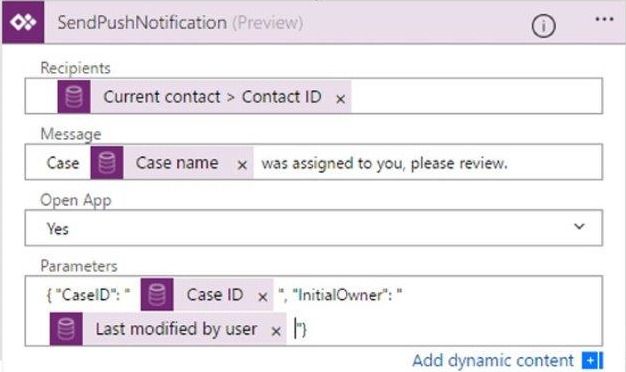 Create an action for the flow by using the PowerApps Notification connector, and enter the App ID of the app to which you want to send notifications. You can also rename the connection to reflect your scenario. (optional) Pass parameters to the app when it opens (after the user taps the push notification). In our example, we pass along the Case ID and Initial Owner fields for the selected contact. You can send a push notification from one app to another or to the same app. In PowerApps, go to the app to which you want to send push notifications. On the Details tab, copy the App ID of that app. 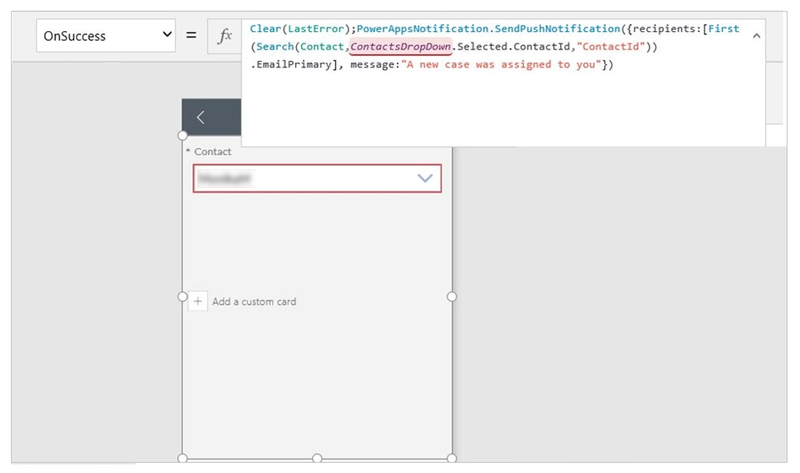 On the Connections tab, create a connection to the PowerApps Notification connector, and paste in the app ID from the previous step. Add the connection to the trigger app. In our example, we use the same app as the trigger app. The user who reassigns the case also triggers a push notification to the new case owner. From the push notification connection, call the SendPushNotification method. In our example, we trigger this notification by using the OnSuccess property in a form. Your push notification can pass specific parameters to the app. For example, to read the CaseID value, use Param("CaseID"). To quickly identify this parameter, add a Label control to your app. Set the Text property of that control to Param("CaseID"). If the user opens the app from the All apps list, the value is empty. If the user opens the app from another location on the device, the value is populated with the CaseID value. (optional) Hide the Timer control by setting its Visible property to false. Set the OnVisible property of the screen to Timer.Start(). Create an empty page that your app doesn't already open, add a Text Input control, and set its timer.Duration value. When you create the app, set the timer to a non-zero value. When you're ready to publish the app, set the value to 0 to immediately trigger the timer. SendPushNotification Sends a push notification to the app that's specified in the connection settings for the notification. message String, required The message body of the push notification. openApp Boolean, optional Whether to open the app when the user taps the push notification. params Parameters, optional Key-value parameters to pass with the notification. These can be further processed in the app to open a specific page and load a specific state. message: "A new case was assigned to you." Send a notification that opens an app and passes along specific parameters. Currently, notifications aren't displayed on PowerApps Mobile for Windows Phone. Currently, we don't provide push notifications for users who run apps only in a web browser. Notifications show the generic PowerApps icon instead of a specific app icon. When you use Microsoft Flow, you can send a push notification to only one recipient at a time. For reference information, see PowerApps Notification reference.